IMPORTANT!! For use in the Axial Wrath on 3s lipo (11.1v) you must use a 16t pinion to avoid overheating the motor!! 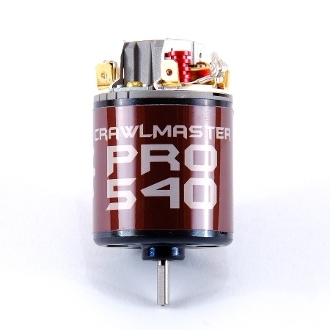 When you need the smoothest power delivery available, the Crawlmaster Pro is the best choice. Holmes guarantees the finest parts and construction techniques available. Our building team has a combined 45 years of experience. We have provided motors for 1st place competitors, robotics, and off road vehicles around the world! Our professionally crafted motors begin with Japanese quality parts and USA hand winding and assembling. Armatures feature pattern winds with specific wire sizes to suit your needs. Wind termination is reinforced using high-temp silver alloys, with state of the art resin impregnated coils. All armatures are precision balanced and the commutator is diamond trued. One cannot build a finer or more precise motor! Every motor carries a 30 day warranty to cover manufacturing defects and is guaranteed to be high quality or your money back. Holmes reserves the right to modify your custom order to ensure proper operation. Current build time from order date is 2 weeks or less. * Hand-Wound Armature – Our pro-level armatures feature a 1-3 pattern hand-wound wind with specific wire sizes developed to take all that your high power electronics can dish out. We optimize copper fill for best power and torque. Wind termination is reinforced using high-temp silver alloys, with state of the art epoxy resin impregnated coils. All armatures are then dynamically balanced with epoxy and the commutator is diamond trued. All armatures are stamped with wind. One cannot build a finer or more precise armature!